The UK will provide £2m of humanitarian relief for the victims of ethnic violence in Burma's Rakhine state, the British government has announced. The UK's Department for International Development said the aid would help to supply emergency water, sanitation and healthcare to more than 58,000 people. Tension remains high between the Buddhist Rakhine and minority Muslim Rohingya communities in the state. Development Secretary Justine Greening said aid action was needed immediately. 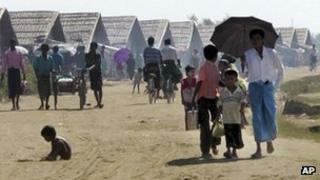 She said: "The recent outbreak of violence in Rakhine state has forced tens of thousands of people to flee their homes. Many are living without basic water and sanitation. "We must act now to relieve the immediate suffering and to ensure that conditions do not worsen to cause further loss of life. "British aid will provide emergency sanitation, clean water, healthcare and nutrition to those affected by this terrible violence. But Britain cannot do this alone and we call on other donor countries to join in this relief operation." The UK's relief effort in Burma will last over a period of six months, and be delivered through a group of non-governmental organisations. The Burmese government estimates that 28,000 people have been displaced since the latest violence started on 21 October, and more than 100,000 forced to flee in total since clashes began in June. The British government has previously expressed its deep concern at the violence in Rakhine, and called on all sides to end the conflict. The UN has warned that Burma's reform programme could be put at risk by continued communal violence in Rakhine.